As with many small market towns Frecclesham craved a railway connection to London and the coast. There was a belief that railways would bring prosperity, and as part of the great railway expansion of the 19th century an Act of Parliament was approved in 1891 to build the line from Lower Bannister thru to Hazelhurst with a station at Frecclesham. In the end the line only reached as far as Frecclesham. This was due to a combination of financial miss-management by the then MD (Major B.Nock, survivor of Balaclava) and the woefully incompetent surveyor (Mr H.Crun) who actually built the line from Upper Bannister. The line finally opened in 1901, successfully missing the golden age of railway building and any chance of deriving financial benefit. Always a sleepy back water it retained pretensions of connecting thru to Hazelhurst. Hence the general layout is that of a thru station rather than a terminus. Frecclesham (pronounced Freccles  Ham) marketed itself as The Home of the Alternative Eccles Cake, a delicacy which was unique to the area. To the unwary this could come as a shock, containing as it did potted shrimps in the place of raisins. It was access to shrimps from the coast that was the motivation behind early attempts to establish a rail link. The rail link came too late to save the pungent delicacy disappearing from the dinner tables of the UK, a situation few lamented. Major B. Nock (1820 to 1905) : Local opinion was divided on the Major, he portrayed himself as a man of independent means and a survivor of the Battle of Balaclava claiming to have taken part in the Charge of the Light Brigade. His detractors suggested his survival was due to oversleeping that fateful morning. He was a significant figure in the early history of the railway, becoming MD of the company. Resigned his post after accounting irregularities where uncovered, nothing was ever proven. H.Crun (1795  1892) : His early life is shrouded in some mystery, earliest records reveal him as Bat Man to Lord Raglan during the Crimean Campaign, by which time Henry was already in his 60s. His army career was cut short after the inadvertent substitution of a dry cleaning ticket for Light Brigade orders caused some embarrassment to his employer. This view is taken thru trees showing the signal box and station throat. The tandem (3 way point) gives access to the Bay, Main Platform plus Yard/Loop. The box is a Churchward kit of the Swanage box, slightly modified to suit the location set back into the bank in a walled reces. The kit was built by TYS and finished by The Chairman (who also added the interior). The picture also shows the point rodding (installed by Lazy Bones Hall) which adds to the scene. Next up is the signal wire. The track components came from C&L Finescale, who carry a similar picture on their website at present. Below is the same area as above viewed from the Goods yard. 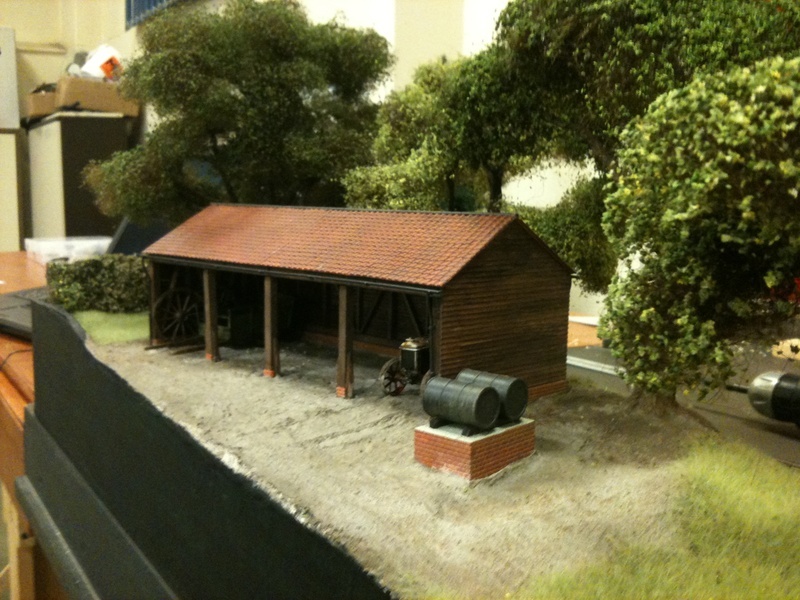 Below is a picture of the Barn which is used to hide the layout entrance. This was taken when it was the only part of the layout with any scenic treatment. Built seperately even at this stage it is just placed in situ. 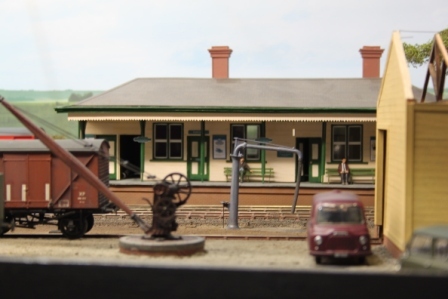 Below is a view of the Station Building looking thru the goods Yard. The Goods shed to the right now has a roof and will be the subject of a future photo addition. I included this view as I quite like the staging and effect! The following is a typical scene during operation. The M7 and Maunsell Pull-Push set are waiting for the road in the Bay whilst the SECR D1 has run round the Lyme-Regis set and will follow on in a while. The final scene is one that is not viewable when on show, and only rarely to us! The Chairman took this looking toward the Station from the FY end. 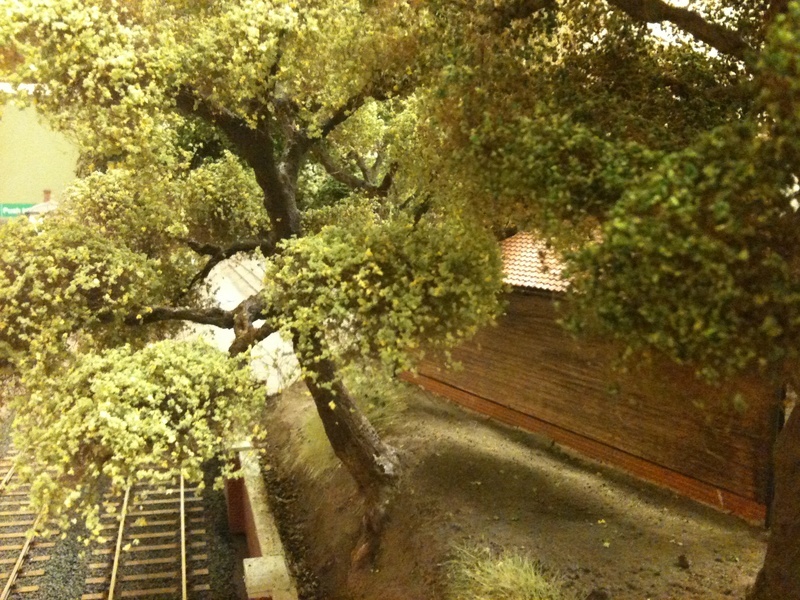 The picture shows the rear of the Barn and the tree directly behind it (when viewed from the front of the layout). 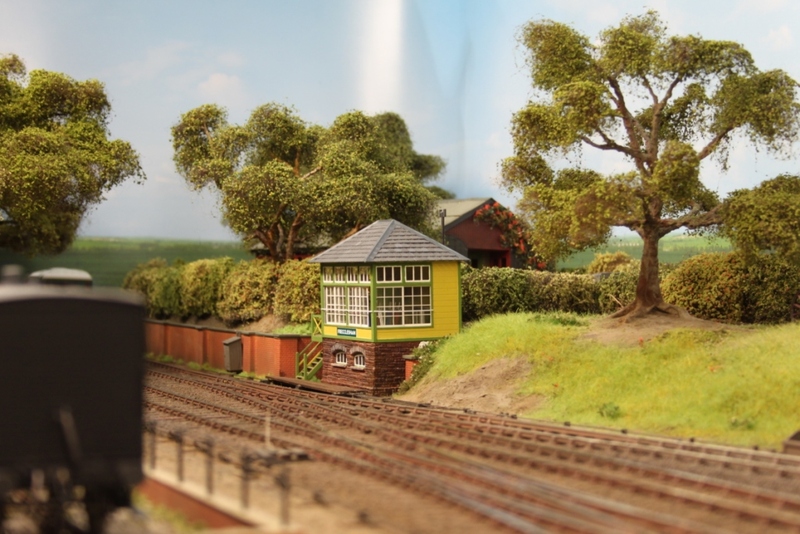 The trees are a significant feature of the layout, which for such a small space has quite a few! The general idea was to avoid for example a road bridge hiding the entry/exit, by obscuring a hole in the back scene - this where the Barn and trees come in. LMJ will have a road bridge scenic break for at least one of the entry/exit points!